The skin care industry is inundated with labels: nontoxic, natural, organic, hypoallergenic, vegan, gluten-free, non-GMO, as well as a host of industry labels confirming purity or sourcing. The reality is that very few of these claims are regulated or verified by a reputable authoritative body. The cosmetic industry is a buyer-beware market, but the following distinctions can shed light on what’s in a skin care label. The cosmetic industry falls under the purview of the Federal Drug Administration (FDA) and is regulated under the Federal Food, Drug, and Cosmetic Act and the Fair Packaging and Labelling Act. However, the term “organic” is controlled by the U.S. Department of Agriculture's (USDA) National Organic Program, in accordance with the Organic Food Production Act. The USDA organic label means that the agency has verified that a product’s ingredients were produced in accordance with federal standards and verified by an accrediting agent. Organizations must be able to demonstrate that at least 95% of the ingredients were grown without the use of pesticides, fertilizers, or genetically-modified organisms, and processed according to strict cleanliness standards. Products can still be organic without the USDA label. When looking for organic skin care, always review the ingredient list to verify what is in a given product. If a cream or lotion includes a lot of synthetic preservatives or genetically-modified ingredients, you can assume it’s not organic. That said, products that contain some organic ingredients can still be quite potent, and certified nontoxic skin care is something well worth looking into before you put a product on your face. The FDA does not regulate the term “nontoxic,” though there are several trustworthy third party certifications that enforce strict nontoxic standards, such as MADE SAFE™. Nontoxic usually refers to products made without ingredients that can bioaccumulate in our bodies and interfere with our hormones or nervous system. Look for products that are made without the “Toxic 10,” which are harmful ingredients often found in shampoos, lotions, and nail polish. These include parabens, sulfates, mineral oil, phthalates, oxybenzone, lead, aluminum, triclosan, polyethylene glycols, and hydroquinone. There is no FDA definition regulating the use of the word “natural.” Natural skin care typically alludes to ingredients from plant materials such as herbs, flowers, or essential oils, or natural substances such as beeswax. While you should always review the ingredient list, there are strict third-party certifications that can also verify a company’s claim of using natural ingredients. According to the FDA, hypoallergenic cosmetics are “products that manufacturers claim produce fewer allergic reactions than other cosmetic products.” The FDA adds, “The term means whatever a particular company wants it to mean. Manufacturers of cosmetics labeled as hypoallergenic are not required to submit substantiation of their hypoallergenicity claims to FDA.” Given this, one might want to take a hypoallergenic claim with a grain of salt and be sure to still look into the product and its ingredients thoroughly before use. There is a wide range of third-party certifications within the cosmetic industry, and some are stricter than others. One of the leading independent labels is MADE SAFE™, a nontoxic certification verified by scientists that a product’s ingredients and supply chain are entirely free of endocrine disruptors, carcinogens, parabens, SLS and SLES, synthetic fragrance, phthalates, GMOs, gluten, and animal cruelty. A MADE SAFE™ certification can give consumers a vote of confidence that they have the right product in their hands. True Botanicals believes in pure and potent skin care treatments that are proven with independent clinical trials. Their high-performing moisturizers and oils, including face oil for oily skin, are designed to nourish, replenish, and hydrate skin with botanical extracts, vitamins, antioxidants, and essential oils. True Botanicals’ products are made with independently certified-nontoxic ingredients and are gluten-free, non-GMO, cruelty-free, and Leaping Bunny certified. It’s also the first skin care company that has taken the time and care to ensure its entire product line is MADE SAFE™ certified. For some, a good workout is as much a part of a daily routine as morning coffee or the evening news. For others, the gym isn’t quite as routine, but you do what you can. Regardless of the frequency or intensity of your workouts, an exercise routine should leave you with that perfect feeling of exhaustion and satisfaction, and of course a little sweaty. Toned muscles and a healthy disposition are great byproducts of physical exercise, but sweat-clogged pores definitely are not. Follow this workout-specific skin care routine to ramp up your fitness while avoiding unwanted breakouts. It may seem like an old wives’ tale but sweating with a full face of makeup is a great way to introduce bacteria, dirt, and oil into your pores. The real damage comes not from the actual workout, but from mixing makeup with sweat, bacteria, dirt, and letting it sit on your face afterwards. Although it might be a hassle to remove and then reapply makeup, your skin will thank you. Before heading out on a run or getting set up for a spin class, take a few minutes to cleanse your skin with a makeup-removing towelette or hydrating cleanser. Look for products infused with aloe vera, green tea seed oil, and jojoba seed oil to remove makeup gently and naturally. Give yourself a little boost before hitting the gym with a few drops of face oil. Instead of trapping sweat in your skin’s pores, a hydrating face oil will act as an antibacterial and anti-inflammatory agent, keeping skin nourished while eliminating toxins. Look for products formulated with renewing and nourishing ingredients such as neroli flower oil, jasmine flower extract, red pine needle oil, jojoba seed oil, green tea seed oil, and non-GMO vitamin E for that extra bit of glow. Nothing feels better on tired muscles (and sweaty skin) than a warm shower. Even if it’s a quick five-minute spritz before heading back to work, it’s crucial to wash off that hard-earned sweat. Add a hydrating cleanser with antimicrobial, infection-fighting ingredients to keep skin healthy, hydrated, and glowing for the rest of your workday. Moisture is so important when it comes to fighting off bacteria and keeping skin healthy. When you step out of the shower, add a few drops of your favorite face oil to replenish your skin’s moisture and natural oils. If you’re prone to breakouts, consider using face oil for acne after your workout. Look for products specifically formulated to regulate sebum production, which leads to excess oil and breakouts. Other key properties include antibacterial ingredients to heal infections and antioxidants to revive and replenish skin. If you prefer to do your workouts in the evening, call it a night by applying a face serum over your face oil. An overnight treatment will help strengthen your skin’s natural barriers while preventing further damage from environmental toxins. Just a couple drops will trap moisture and boost nutrients, leaving skin soft, smooth and ready to go when your morning alarm goes off. True Botanicals believes in pure and potent skin care treatments that are proven with independent clinical trials. Their high-performing formulas are designed to nourish, replenish, soothe, and hydrate skin with botanical extracts, vitamins, antioxidants, and essential oils. True Botanicals’ products are made with independently certified-nontoxic ingredients and are gluten-free, non-GMO, cruelty-free, and Leaping Bunny certified. What Are Antioxidants and Why Are They So Important in Skin Care? Antioxidants seem to be everywhere from infused teas to energy drinks to chocolate to skin care. It’s tempting to dismiss this trend as a well-crafted marketing campaign, but the truth is, antioxidants are some of the most effective and natural treatments for combating cellular damage and signs of aging. Antioxidants are molecules that help repair and protect cells against oxidative damage caused by free radicals. Free radicals are highly reactive molecules that can cause damage to cell membranes and DNA. Although the formation of free radicals is a normal part of the metabolic and aging process, exposure to UVA rays, air pollutants, industrial chemicals, and carcinogens can accelerate the formation of free radicals at the cellular level. When cells become oxidized, they lose the molecular components that make them stable. Damaged cells can interact with and break down other molecules in our body, like our DNA, lipids, and proteins. Antioxidants play a key role in stopping this cycle. Antioxidants can seek out and destroy free radicals before they cause further cellular damage. This can slow the aging process. What Are the Side Effects of Cellular Changes? Chronological: An individual’s natural and predetermined disposition to certain diseases, conditions, and characteristics. Photoaging: A function of exposure to environmental toxins, ultraviolet rays, and pollutants. Both chronological and photoaging are associated with cellular changes, with different degrees of severity. Chronological aging can advance our skin’s aging process through increased laxity, fine lines, and wrinkles. Photoaging, on the other hand, can be associated with dryness or a leathery appearance, and more serious conditions like precancerous growths or even skin cancer. How Can Antioxidant Skin Care Help Protect Against Cellular Damage? Antioxidants can take many forms, including ascorbic acid, vitamin E, vitamin C, lycopene, carotenoids, or a mixture. Although we absorb antioxidants naturally through teas, vegetables, and fruits, topical application through creams and oils can also increase antioxidant uptake. According to research published in ISRN Dermatology, vitamin C has been found to increase collagen production, protect against damage from sun exposure, correct pigmentation issues, and decrease skin inflammation. Green tea polyphenols have also been shown to have anti-inflammatory, anti carcinogenic, and anti aging properties. An antioxidant serum or booster infused with healthy extracts such as tapioca starch, resveratrol, quercetin, and other healthy antioxidants can protect skin from UV damage and other environmental toxins that advance the skin’s aging process. As a bonus, a potent antioxidant serum can fight other signs of aging, including sagging skin, wrinkles, hyperpigmentation, and skin inflammation. An antioxidant serum is excellent as a stand-alone product, but Incorporating it into your anti aging skin care regimen can increase antioxidant absorption at every stage of application. From a hydrating cleanser that softens and hydrates to a renewing facial mist that leaves a radiant glow to a soft facial oil that restores and protects, a skin care routine replete with antioxidants and healthy fatty acids will help nourish skin and prevent future damage. True Botanicals believes in pure and potent skin care treatments that are proven with independent clinical trials. Their high-performing formulas are designed to nourish, replenish, soothe, and hydrate skin with botanical extracts, vitamins, antioxidants, and essential oils. From their day and night face oils to their powerful anti aging cream, True Botanicals’ products are made with independently certified-nontoxic ingredients and are gluten-free, non-GMO, cruelty-free, and Leaping Bunny certified. Many of us ritualistically protect our face with a separate moisturizing serum or cream for daytime and nighttime. This widely adopted grooming habit replenishes much-needed moisture and helps keep our delicate facial skin looking healthy, hydrated, and nourished. In addition to these moisturizing properties, a high-quality skin serum applied nightly can also combat various signs of aging, such as that slight sag of the cheeks, a few wrinkles around the eyes, or the parenthesis that form around our mouth. These signs of aging (or wisdom, depending on your perspective) tend to appear as our skin loses structural resiliency, often due to excessive sun exposure, environmental toxins, and natural cellular changes. However, in our efforts to moisturize and protect our face, we might be forgetting the other delicate areas that are exposed to the same harmful elements such as UV rays, extreme heat or cold, and free radicals, and can show signs of aging just like our face. According to research published in Dermato-Endocrinology, our neck and chest may exhibit signs of aging more quickly than our face since they are exposed to the same environmental elements as our face, but we often neglect to moisturize these sensitive areas. Additional research published in the journal Skin Research and Technologyfound that the dermal layer on our neck is thinner than facial skin, leaving it more prone to environmental damage. Researchers found that our neck’s elasticity correlates negatively with age, meaning that the skin around our neck, particularly sun-exposed skin, is more susceptible to wrinkles and aging than our face. Replenishing the moisture in our face, neck, and chest with a nightly serum can help repair cellular damage that contributes to signs of aging or skin inflammation. It can also help stimulate blood circulation and new cell growth. To properly moisturize these ultra-sensitive areas, look for a highly concentrated hydrating serum that is formulated with ingredients that fight free radicals and act as a natural moisturizer. Seaweed and sodium chloride, green tea leaf extract, glycerin, neroli flower water, and superoxide dismutase all work to repair cellular growth by protecting against free-radical damage, detoxifying the skin, replenishing antioxidants, and maintaining water balance on an intracellular level. You could also couple your moisturizing routine with a hydrating cleanser that purifies and cleans skin without stripping away natural oils. This restorative support and hydration will leave skin feeling purified and toned, and acts as a perfect precursor to a chest, neck, and facial moisturizing routine. Pat your skin dry—don’t rub. Each of these steps will help replenish and retain moisture in your face, neck, and chest, and combat cellular and surface-level damage associated with prolonged exposure. Our skin is our body’s largest organ, and it’s important to protect more than just our face. An anti aging serum formulated with hydrating, nourishing, nontoxic ingredients can penetrate well below our skin’s outer layer to repair, replenish, and strengthen areas that are regularly exposed to environmental elements. There are a host of acne skin care options on the market today, ranging from oral antibiotics to over-the-counter treatments to prescription medications to complementary and alternative medicine (CAM). The latter is an emerging, almost counter-culture approach to acne management that treats skin with herbal medicine, acupuncture, or dietary modifications instead of conventional medication. However, there is a lack of clinical evidence demonstrating the effectiveness of CAM therapies, making it hard to know whether it’s a viable treatment option. A 2015 meta-analysis of 35 studies and 3,227 participants tried to address this gap by evaluating the effectiveness of six CAM therapies, including herbal medicine, acupuncture, cupping therapy, diet, purified bee venom (PBV), and tea tree oil. Their primary objective focused on evaluating the “improvement of clinical signs assessed through skin lesion counts,” which included inflammatory lesions, change in skin lesions, and change in acne severity. Data from one of two trials comparing a low-glycaemic diet with a high-glycaemic diet (i.e., carbohydrates that increase a person’s blood sugar level) found that a lower glycaemic diet reduced inflammatory lesions in 43 participants. Results from a single trial revealed that tea tree oil improved total skin count legions in 60 patients, compared with a placebo. Another trial showed that pollen bee venom reduced the number of skin lesions in 12 patients. Results from 31 other tests yielded inconsistent effects regarding the effectiveness of acupuncture, herbal medicine, or wet cupping to reduce skin lesions. The results of this 35-study meta-analysis can help guide consumers interested in a natural acne treatment while avoiding the pitfalls of misleading marketing claims. Green and white tea: Natural astringents that tone, soothe, and protect against oxidative stressors in the environment. Glycerin: A natural humectant (i.e., moisturizer) and emollient (i.e., softener) that hydrates skin on an intracellular level. Black willow bark extract: Known as the natural salicylic acid, this will exfoliate and cleanse skin. Helichrysum splendidum flower oil: An antibacterial and antifungal oil that will soothe and heal acne-prone skin. Seaweed and sodium chloride: An anti-inflammatory topical that detoxifies skin at the cellular level. Sandalwood hydrosol: An antimicrobial sourced from Hawaiian sandalwood trees that acts as a natural astringent and disinfectant. Pumpkin seed oil. Helps balance skin’s sebum production to heal and fight acne. If you’re struggling to fight acne but want to avoid harsh chemicals, you have plenty of effective options in the form of cleansers, serums, and natural treatments. However, in the highly saturated skin care market, taking the time to critically review products for their effectiveness will be well worth your time and money. Acne is the most common skin condition the United States, according to the American Dermatology Association, affecting nearly 50 million Americans each year. While acne is most prevalent in adolescents and young adults, an estimated 15% of women report struggling to treat acne well into their adult years. People are willing to spend serious money to treat adverse skin conditions, giving rise to a topical acne skin care market worth over $3 billion globally. With countless cleansers, toners, and products on the market today, consumers have more choices than ever before to treat acne-prone skin. The sheer number and diversity of products might be overwhelming for many people, but Informed Health Online, a publication from the U.S. National Library of Medicine, outlines a few strategies that can help acne-prone skin, as well as some surprising things you might be doing that make your acne worse. Many soaps have a pH between 8 and 10, which can irritate your skin. pH, or power of hydrogen, measures the acidity or alkalinity of a solution. Soaps with a higher pH can damage the outermost layer of protective skin, stripping it of moisture and natural oils and leading to redness, dry skin, and breakouts. Sucrose cocoate: A natural humectant. Lavender oil: An essential oil that relaxes and soothes. If you have oily skin, you might be tempted to wash your face a few extra times a day to modulate excess oil. Unfortunately, excessive cleansing and washing can have the opposite effect. When you strip your skin of its natural moisture, you alter your skin’s pH, which causes dryness, irritation, breakouts, and can actually cause your skin to produce more oil. Green tea seed oil: A natural emollient, rich in antioxidant polyphenols, that will dissolve excess oil while improving skin’s appearance. We’re all guilty of it: picking at a blemish in the hopes of making it go away. Unfortunately, the opposite happens. Picking at your skin can introduce bacteria to your skin, often pushing it deeper and possibly making your breakout or acne much worse. The same goes for concealers. Makeup applicators might introduce bacteria to an infected area of the skin, and conventional acne medication might be made from waxy oils that clog pores. It’s hard to predict how your skin will react to concealers, topical creams, and external bacteria from your hands or applicator. A better solution is a high-quality acne face wash that addresses the underlying problem. Seek out products with nontoxic, hydrating, and antioxidant properties that will soothe, instead of exacerbating, acne-prone skin. As the wellness and beauty industry starts to lean toward cleaner formulas, natural and nontoxic ingredients are distinctly favored among consumers for their skincare and self-care routines. If you’re looking to revamp your self-care products with nontoxic alternatives, here are a handful of high-performance natural ingredients to look for. This moisture-preserving humectant is a natural skin care staple for a reason. Not only does it prevent moisture loss, but it also helps improve the skin’s natural firmness with antioxidants like beta-carotene, vitamin C, and vitamin E. Aloe vera is often used in natural shampoo and conditioner formulas to balance and soothe a dry or irritated scalp. This ingredient doesn’t interfere with cleansing, making it one of the more attractive hydrating humectants for nontoxic self-care products and formulas. Look for this in a hydrating shampoo, face cleansers, and other skincare for sensitive skin types. This powerful antioxidant hydrates hair, protects it from UV damage, and provides great barrier function to hair and skin. It has excellent oxidative stability and helps lock in hydration and fragrance. It’s similar to jojoba oil, with a rich texture that prevents dryness in hair and skin. Look for this ingredient in a nourishing shampoo and conditioner made with natural and organic elements. Protect your skin with potent antioxidants found in green and white tea leaf extract. A natural astringent, tea polyphenols soothe and tone with powerful anti-inflammatory properties. This ingredient has been shown to prevent damage from the oxidative stress that occurs from sun exposure. Look for this in a pore minimizer mask to deposit antioxidants where they’re needed while exfoliating and hydrating with other high-performance, nontoxic ingredients. Saccharomyces ferment converts yeast into amino acids, organic compounds that have the power to stimulate collagen and elastin production. Combined with the black tea ferment that makes kombucha, this glow-inducing ingredient is a skincare powerhouse ingredient. Kombucha restores the skin’s pH while healing and detoxifying for long-term health and luminosity. Choose a toner or mist with kombucha to balance skin before applying a nontoxic face oil. Best for those who struggle with acne or oily skin types. For those who have acne-prone skin, safflower oil in a high-performance face oil can transform blemish-ridden skin. This emollient is loaded with benefits, from cleansing to hydration. Safflower oil removes dirt and excess oil before it replenishes moisture and elasticity to struggling skin. It’s rich in linoleic acid and essential vitamins that enhance the skin’s protective barrier. For hydration that doesn’t clog pores and cleansing that doesn’t strip, a face oil with safflower oil is your new skincare go-to. The edelweiss flower is able to withstand the conditions of the Alps, from high altitudes to harsh weather. It’s packed with antioxidants that help your skin battle against external forces like UV damage and environmental pollutants. Renew and regenerate skin that has visible signs of aging and skin damage with a repair serum that includes the powerful effects of the edelweiss flower. True Botanicals creates high-performance formulas by combining nontoxic and natural ingredients to target specific skin issues. Their collections include Aging, Acne, Rosacea, and Pregnancy skin care that deliver uncompromising nourishment and radiant skin. Beyond your favorite pair of leggings and trusty running shoes, keeping your gym bag stocked with post-workout essentials keeps you ready for wherever you’re going to next. Take care of your skin and hair by using shower essentials with natural and nontoxic ingredients that nourish while they cleanse and hydrate. When you’re breaking a sweat and pushing yourself to the limits, caring for your body afterward keeps you healthy and feeling your best. If you use gym time as part of your self-care routine, why not continue that to your cool down and shower, too? Here’s a list of shower essentials with natural ingredients to keep in your gym bag. Note: Don’t forget to have a waterproof toiletry bag to keep your shower products from leaking onto your gym clothes and bag. No one wants to find body wash on their sports bra. Start by washing your hair with an antioxidant-packed shampoo and conditioner. The best, high-performance formulas are free of synthetic elements, sulfates, and surfactants. Natural ingredients you should look for in your shampoo include green tea oil, meadowfoam seed oil, and aloe leaf extract. Cleanse your hair without stripping, successfully preparing it for your hydrating conditioner. Nourishing conditioner ingredients that leave hair soft and silky include shea butter and macadamia seed oil. These provide lightweight hydration that restores vibrancy to otherwise dull hair. Leave this in for a few minutes before rinsing it out to allow your hair to absorb the potent moisture in a nontoxic formula. Instead of using a body wash with a synthetic fragrance, choose a formula that contains essential oils and organic ingredients. Post-workout, your skin needs to be cleansed of sweat without removing moisture or drying out the surface. Cleanse without stripping your skin with natural ingredients like green and white tea, aloe leaf extract, and olive fruit extract. Avoid formulas with SLS and synthetic elements. After shampooing and conditioning your hair, wash your body with your favorite organic body wash formula. This ensures that you’re not only cleansing your skin of sweat, but that your pores won’t get clogged by the shampoo and conditioner you’ve washed out of your hair. Prevent acne and clogged pores with a hydrating cleanser that contains antibacterial and antimicrobial ingredients like black willow bark extract and green and white tea. These ingredients fight infection and help balance your skin to ensure it’s hydrated and healthy. Drying out your skin to prevent acne from the sweat after your hot yoga class can actually cause early signs of aging and other issues. Wash your face last in your shower routine so that you can immediately follow up with a toner and face oil post-shower. Gym Shower Tip: Bring a pair of shower sandals to avoid getting foot fungus or other issues that can occur from using public showers. Let them dry out completely before putting them back into your gym bag to avoid mold and mildew (or, if you’re pinched for time, set them out to dry soon after reaching your next destination). Don’t let all of that nourishing hydration dry out within a few minutes of stepping out of the shower. While your skin is still slightly damp, apply an organic body lotion formula to protect the rich hydration you got from your body wash. This locks in the hydration without clogging pores. Ingredients like green tea oil prevent damage with potent antioxidants while shea butter diminishes water loss and protects you from the sun. Keep your body happy and healthy with nontoxic shower essentials that cleanse and hydrate your body after the toughest workouts. Experience self-care beyond the spin class or treadmill with nourishing products for radiant skin and hair. True Botanicals creates high-performance skin care formulas by combining nontoxic and natural ingredients to target specific skin issues. Their collections include Aging, Acne, Pregnancy, and Rosacea products that deliver uncompromising nourishment and radiant skin. If you’re still following the same skincare routine that you started in your teenage years, it’s time to re-evaluate. Your skin needs (and the products available) have changed in the last decade or two. Streamline your products and reinvigorate your skin with these skincare essentials that can nourish and strengthen every skin type. A high-performance toner is a primer for the rest of your skincare routine. If you struggle with acne, choose an antibacterial toner that balances oil production while leaving skin nourished and hydrated. Toner ingredients like kombucha balance and restore pH while healing and detoxifying the skin. If your skin struggles with inflammation or sensitivity, a nutrient mist acts as a calming and soothing toner to hydrate, repair, and nourish. Natural skin care ingredients like blue chamomile flower extract are packed with anti-inflammatory properties and soothing phytochemicals. Apply your toner after you cleanse and pat your face dry. Wait till it mostly dries before following with a moisturizer. This beauty product is your new source of potent hydration that doesn't clog pores or sit on the surface. Face oil is especially crucial for those with acne-prone complexions. Choose a face oil for oily skin types to get the hydration your skin needs while balancing sebum production and clearing pores of bacteria, dirt, and toxins. Antibacterial ingredients and antioxidants work together to heal infection and revive vibrancy for overall healthier and more radiant skin. For those who struggle with flaking and peeling, face oils deliver potent hydration deeper than traditional lotions or creams. This heals and strengthens skin cells before they reach the surface and prevent inflammation, dryness, and flaking. Apply face oil in the morning and at night, after your toner and before your skin serum. Minimize pores, exfoliate dead skin, and hydrate at every level with a lactic acid face mask once or twice a week. Dead skin cell buildup can cause a dull or dry looking complexion. Some trendy face masks currently use chemical peels or harsh ingredients that strip skin of essential nutrients and oils without moisturizing what’s underneath. A lactic acid-based face mask removes dead skin cells while delivering potent nutrients deeper. If you have sensitive skin, patch test a face mask on a smaller area of your skin before applying it to your entire face. Apply after cleansing and drying your face, washing off after the recommended time and then continuing with your everyday skincare routine. This is true for all of your skincare products, from your spot treatment to your cleanser. Your skincare ingredients should be focused on using nontoxic ingredients and natural and organic sources whenever possible. Research your skincare brands to understand their ingredients and find out whether they use parabens or sulfates in their formulas. True Botanicals is the only skincare brand independently certified nontoxic by MADE SAFE™, ensuring that every product is safe for humans and the environment, and free of harsh chemicals found in many beauty products. Transform your skincare and get back to the essentials with a nontoxic routine that’s packed with certified organic and wild-harvested ingredients. True Botanicals creates high-performance formulas by combining nontoxic and organic skin care ingredients to target specific skin issues. Their collections include Aging, Acne, Pregnancy, and Rosacea products that deliver uncompromising nourishment and radiant skin. Face oils are quickly taking over the beauty and wellness industry for their skin-loving nutrients and stunning results. The best face oils are formulated for a range of skin issues, from acne-prone complexions to signs of aging. They simplify your skincare routine without removing any of the results you’re looking for. Face oils can even deliver solutions to a variety of issues in one formula. This guide provides the best face oil ingredients for signs of aging and acne as well as for sensitive and dry skin types. Unlike traditional face creams and lotions that stay on the surface of the skin, face oils deliver potent moisture and powerful nutrients to the deeper layers of the skin. A face oil formulated for strengthening skin and repairing damage reduces signs of aging and sun damage. Key ingredients for anti aging face oils include chia seed, kiwi seed, passion fruit, and papaya seed oil. These are packed with omega-3 fatty acids to strengthen the cell membrane barriers for water and nutrient retention. They also condition the skin beyond the surface. Green tea seed oil reduces flaking and improves overall appearance for a radiant glow. Clear blemish-ridden skin with a high-performance face oil for acne. Contrary to popular belief, face oils for oily skin types don’t clog pores or cause acne. They deliver lightweight hydration while clearing pores and balancing sebum production. Face oils for acne are formulated with antioxidants, antibacterials, and anti-inflammatory properties. The best face oils include ingredients like hemp seed oil, pumpkin seed oil, borage seed oil, and safflower oil. Replenish moisture while clearing clogged pores and regulating excess oil production with a face oil in your morning and night skincare routines. If you struggle with rosacea, inflammation, or other skin sensitivities, face oil can deliver the hydration and nourishment your skin craves. Inflammation should be addressed with cooling and soothing ingredients that go beyond the surface. Sesame seed oil is a jackpot ingredient for sensitive skincare. It reduces flaking, soothing and softening cracked skin. It’s also high in fatty acids that form a strong protective barrier on the surface of a skin type that struggles to retain moisture. Paired with antibacterial helichrysum and lightweight hydration grape seed oil, a face oil with these ingredients will soothe and strengthen sensitive skin types without irritation or inflammation. As previously mentioned, traditional lotions and creams stay on the surface and struggle to hydrate skin at every level. Face oil not only moisturizes at a deeper level, but it can also have pure nutrients that penetrate deep to keep skin healthy from the inside out. If you constantly struggle with dullness and dryness, a hydrating face oil can restore a natural radiance without harsh or harmful formulas. In the morning, apply a few drops to your skin followed by SPF 20 sunscreen. At night, cleanse and then apply a few drops before using a hydrating face serum. Your skin will drink in all of the rich moisture from the plant-based oils and feel more balanced overall. Your mid-to-late 20s set the bar for how your skin looks for the rest of your life. Collagen production and cell regrowth start to slow, and sun damage can catch up with those sunscreen-less days of your early 20s. Exfoliation, hydration, and deep nourishment are the keys to healthy and glowing skin well past your 29th birthday. While anti aging skin care has its benefits, there are many ways to get healthy and happy skin without harsh formulas. The earliest signs of aging occur from exposure to the sun without protection and drying out your skin to prevent or treat acne. Sun damage can often result in hyperpigmentation, freckles, wrinkles, and fine lines. Beyond using an SPF 20 sunscreen every day to step up prevention, there are certain products, like antioxidants and vitamin C, that help your skin rebound quicker. Drying out your skin to prevent or treat acne isn’t the best strategy long term. Dry skin increases your chance of early fine lines, wrinkles, and dullness. Botanical extracts and oils are antibacterial and antimicrobial by nature and fight acne while preventing future breakouts. They also hydrate your skin, reducing the appearance of pores while preventing wrinkles and fine lines. Here are four preventative and rebounding techniques to help your skin’s natural, youthful radiance shine through. When dead skin cells build up over time, this results in a duller complexion and can often be indicative of deeper dryness or dehydration below the surface. Choose a face mask with lactic acid, fatty acids, and fruit butters to slough away dead skin and hydrate the skin underneath. Fatty acids, like astaxanthin, improve skin elasticity, stimulate collagen production, and reduce wrinkles and dark circles. Apply a resurfacing mask once or twice a week to renew and nourish skin at a deeper level. Follow with a face oil and skin serum to ensure your skin is hydrated and has a strong, protective barrier. The healthy glow that you strive for comes from healthy skin cells, which need antioxidants to thrive. Create your own antioxidant serum at home by combining your favorite skin serum with an antioxidant booster powder. Antioxidants in powder form are more potent and last longer, making them a more viable option for preventative and reparative skincare. Apple peel is packed with antioxidants, like polyphenols, ruin, quercetin, and ursolic acid, that come together to produce restorative effects. This makes it one of the more potent and powerful ingredients in your skincare lineup. Use your antioxidant serum at night in areas that are struggling with wrinkles, hyperpigmentation, or fine lines. This is also a fantastic treatment for clearing acne and brightening dark spots. Instead of using an anti aging cream, choose a face oil formulated for addressing signs of aging. Unlike creams and lotions, face oils deliver nutrients and hydration to the deeper layers of skin where issues begin. They also encourage glowing skin with weightless hydration and skin-loving nutrients. Chia seed and kiwi seed oils are packed with omega-3 fatty acids to help strengthen cell membranes’ barriers. This ensures that water and nutrients are abundant while toxins are kept out. If you’re in your 20s and your skin is still dealing with acne or excess oil, passion fruit oil and papaya seed oil help dissolve excess sebum and impurities on the surface while conditioning deeper levels. Lastly, hydration is one of the most important factors for healthy and glowing skin at any age. Drink at least 64 ounces of water every day and keep dehydrating beverages to a minimum. This includes alcoholic, caffeinated, and sugary drinks. Be conscious of how your diet affects your skin long-term. Don’t forget to include moisturizing products in your morning and night skincare routines. Keeping your skin happy and healthy in your 20s while preventing signs of aging doesn’t have to be frustrating or time-consuming. Protection, hydration, and nourishment are key to radiant skin well past your 20s. Protecting your skin from the effects of UVA and UVB rays is the smartest way to prevent skin cancer and long-term damage. There are several ways that you can transform your current skincare routine to include daily rituals that care for your skin’s wellness without spending hours in the bathroom. Here are a select few daily (or weekly) skincare rituals that provide the protection and reparative results that your skin needs due to sun exposure and damage. Instead of using a heavy face cream, choose an anti aging serum with lightweight coverage and penetrative properties. An overnight, anti-inflammatory treatment can reverse the damage caused by sun exposure and aging. By working from the inside out, overnight treatments strengthen the skin barrier and increase protection from future damage. Ingredients like green tea leaf extract can help prevent the damage associated with skin cancer, wrinkles, and hyperpigmentation. Tea polyphenols are naturally astringent and packed with anti-inflammatory properties. They also prevent the enzymes that break down the natural production of collagen and elastase, leading to early signs of aging. Green tea leaf extract should be a leading ingredient of any skin serum you use to care for sun damage. Protecting skin with SPF against UVA and UVB rays shields it, providing the first line of defense. Instead of treating sun damage, start by protecting it with SPF 20 non-nano zinc oxide sunscreen as your last step in your morning skincare routine. Non-nano zinc oxide is the safest source of sun protection. Paired with antioxidants, this daily protection provides the safety the skin needs and hinders the effects of free radical damage. Apply every morning in every season to protect the skin throughout the year. Be aware that SPF damage can still occur in fall and winter months. Sodium hyaluronate, or hyaluronic acid, is one of the best skincare ingredients for damaged and aging skin types. Not only does it hold 1,000 times its weight in water, but it penetrates deeply to provide the moisture the skin needs along with serious and long-lasting hydration. This powerful element in a hydrating serum helps aging and damaged cells retain water. Hyaluronic acid also provides antioxidant defense against free radical damage and reduces inflammation, making it a safe ingredient for sensitive skin types. The body naturally produces hyaluronic acid, but production slows over time. Reinvigorate aging skin with this impressive polysaccharide. Dead skin cell buildup results in a dull or dry complexion, especially if your skin struggles with retaining moisture. A weekly facial with lactic acid and essential fatty acids slough away dead skin cells and enable potent nutrients to deliver the nourishment the skin cells need. Illuminate a dull complexion in less than five minutes with a resurfacing mask that doesn’t strip, dry out, or dehydrate your skin. While most facials with lactic acid focus on removing dead skin cells, make sure that the one you choose also has hydrating ingredients like mango butter, avocado butter, and jojoba seed oil. Dull skin craves deep moisture, an element that all of these ingredients are packed to the brim with. Experience a lasting glow despite sun damage or signs of aging with a facial at home once a week. The days of brutal summer heat, dehydrating air conditioning, and excessively oily skin are coming to an end. Transitioning your skin care routine from summer to fall might not be at the top of your priorities, but your skin might need some extra help recovering from months of sun exposure and other issues. This is especially important for sensitive skin types and those who struggle with acne or chronic dryness. Calm post-summer skin and prepare it for dry winter weather with these self-care rituals to introduce into your routine. These focus on a more natural approach to caring for your skin with nontoxic ingredients and clean formulas. Whether you have dry, oily, or combination skin, hydration from all fronts is crucial to skin health and natural radiance. Use a hydrating cleanser to avoid stripping your skin of natural oils while sloughing away dead skin cells, dirt, sweat, and buildup. Acne-prone skin can still be dry and needs moisture just as much as drier skin types. Overproduction of sebum, which leads to clogged pores and blemishes, is often a result of dehydration and an attempt to deliver the moisture your skin craves. Choose an acne skin care routine that includes lightweight hydration, from your cleanser to face oil. Your skin might still be dealing with clogged pores from using heavy makeup and thick sunscreens during summer months. Switch to a more natural acne treatment that uses botanical extracts, antibacterial, and antimicrobial ingredients. These are less harsh and have better long-term results for sensitive skin types. If you deal with chronic dryness, the transition from humidity to drier weather could be a tough season for your skin. Use hydrating products in the morning and at night that deliver lightweight moisture at a deeper level. Starting where the skin cells are growing is the best way to prevent flaking, cracking, and other dryness issues. Face oils are your best bet for moisture that actually delivers the results you need. These are also great for combination skin types since they don’t clog pores. In addition to your skin care routine, hydrate with at least 64 ounces of water every day. Keep a water bottle on your desk at work and on your nightstand. Caffeinated drinks and alcoholic beverages dehydrate your skin, making it hard to get the natural glow you’re after. Increased sun exposure can cause discoloration, a common side effect of summer weather. Instead of increasing harsh exfoliation every few days, try a resurfacing face mask that uses lactic acid and vegetable butters to hydrate while it gently removes dead skin cells. This ensures that your skin is never stripped but reveals a newer, brighter complexion underneath. By the end of summer, you’re probably dealing with a few blemishes or even major acne issues. Bacteria buildup and a weakened skin barrier are likely to blame for acne-prone skin during the transition to fall. Include a reparative acne serum to help clear your skin. Ingredients like sandalwood water fend off acne-causing bacteria, while pumpkin seed oil helps balance sebum production to heal skin and fight acne. Consider using a less heavy SPF lotion in your skin care lineup. Or, see if your makeup is clogging your pores. Remember to wash your makeup brushes every week with gentle soap, including your beauty sponges. These are breeding grounds for acne-inducing bacteria. Protecting your skin from autumn dryness by strengthening your skin barrier and hydrating at a deeper level are the best strategies for a summer glow in chilly fall weather. Whether your skin is dull, struggling with acne, or is vulnerable to signs of aging and sun damage, detoxing and rejuvenating your skin with nontoxic skincare encourages a more natural glow without adverse side effects. The following details powerful, nontoxic ingredients that have proven success in repairing and preventing skin damage. Transform your skin with a routine that’s nontoxic and nourishing at a deeper level. Green and white tea leaves contain the potent antioxidants that protect your skin from the oxidative stress that follows sun exposure. Tea polyphenols have natural toning, soothing, and anti-inflammatory properties that can help prevent the damage associated with hyperpigmentation, wrinkles, and skin cancer. This ingredient soothes inflammation and irritation from acne and prevents permanent damage from sun exposure. Green and white tea leaf extract powerfully restore skin to its natural radiance with soothing and protective properties. Choose an acne cleanser or a nourishing mist for instant hydration and long-term reparation. This potent oil is a strong fighter against free radical damage and bacteria growth. It has antibacterial and antioxidant properties that pair well with other botanical oils for fighting signs of aging and repair damage beyond the surface. Acne-prone skin has met its match with this powerhouse ingredient. Black willow bark extract is nature’s original salicylic acid. Unlike its less expensive, and synthetically made counterpart, black willow bark extract exfoliates skin without irritating sensitive skin types. This element is a powerful ingredient in targeting acne because it clears pores, sheds dead skin cells, and stimulates new cell formation. Look for this in an acne face wash or an antibacterial toner that’s formulated to balance oily skin. This gorgeous flower is also a natural medicinal plant rich in anti-inflammatory and antioxidant properties. It’s antibacterial and antifungal, making it a perfect ingredient to fight infections like bacteria-induced acne. Together with its anti-inflammatory properties, it’s also a soothing element that helps heal wounds and minimize scarring, making it perfect for repairing acne scars and signs of aging. Helichrysum flower oil is suitable for oily and dry skin types. Look for this effective ingredient in a face oil or cleanser. Not only does the leaf juice of the aloe vera plant prevent moisture loss, but it also helps improve the skin’s natural firmness with antioxidants and vitamins. This ingredient is vital for rich hydration in a weightless format. Beta-carotene, vitamin C, and vitamin E encourage skin health for a naturally radiant complexion. Aloe vera works great in cleansers, serums, and toners. Look for this impressive ingredient in a hydrating cleanser to clear and prepare your skin for other skincare products. Vitamin C has a superstar status amongst skincare experts. It is a powerhouse antioxidant, a key element of any skincare regimen addressing skin damage or signs of aging. If you struggle with hyper pigmentation, uneven skin tone, or fine lines, incorporating Vitamin C into your daily skincare lineup can help with these issues and more. But first, why should you consider introducing a highly concentrated form of Vitamin C into your routine? This ascorbic acid is an antioxidant and immune booster, abundant in botanical extracts, fruits, and vegetables. Fresh Vitamin C is the most potent and retains the most benefits, from your diet to your daily skincare ritual. Which Issues Does It Address? Vitamin C includes a range of skin benefits, from skin brightening to improving hydration and moisture retention. It also shields your skin from the impact of pollution. Vitamin C evens out skin tone, addressing hyper pigmentation and firmness by stimulating collagen production. This is especially helpful when pairing with an acne serum, as blemishes and cystic acne can leave behind discoloration or scarring. Vitamin C encourages the healing process for quicker repair and faster fading. Because Vitamin C is highly susceptible to oxidation when exposed to light or heat, liquid Vitamin C products tend to expire faster. Choosing a Vitamin C booster in powder form ensures that it retains its potency and is ready to supercharge your favorite face serum. Simply add a few shakes of your Vitamin C booster to a face serum and mix. These forms work well together to restore skin firmness and smooth the surface without exfoliation. Apply to your face, neck, and back at night. Note: When a Vitamin C is mixed with ferulic acid in powder form, the combination doubles photoprotection. This is measured by skin redness and sunburn cell formation. Protect your skin from damage and signs of aging by choosing a more potent form of Vitamin C.
Don’t over-apply Vitamin C in your skincare routine, because high quantities can be irritating for sensitive types. Make sure that you avoid adding it to glycol or salicylic acids. True Botanicals creates high-performance skincare formulas by combining nontoxic and natural ingredients to target specific skin issues. Their collections include Aging, Acne, Pregnancy, and Rosacea products that deliver uncompromising nourishment and radiant skin. 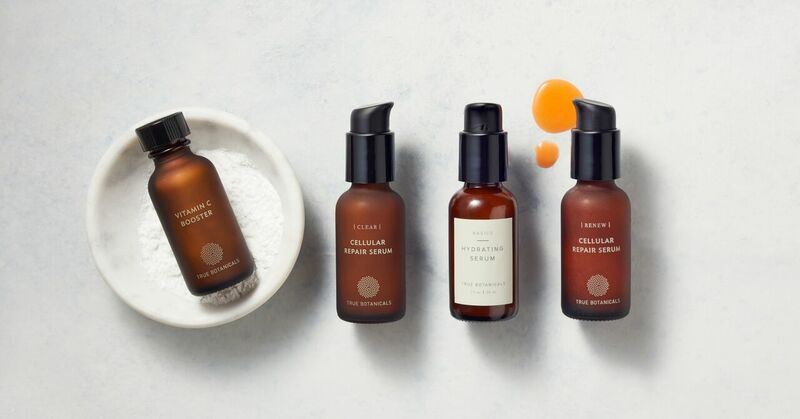 From their bestselling eye serum to their Vitamin C Booster, True Botanicals offers MADE SAFE™ skincare with proven results.